Shower shoes may seem like an unnecessary piece of apparel for you to own but if you’re walking around barefoot in an area with any amount of foot traffic, then you may want to reconsider purchasing a pair. Dorm rooms, public pools, and the shower room at the local gym are all places that act as a breeding ground for fungus and bacteria, which can lead to a nasty infection if you come into contact with either while you’re not wearing shoes. Fungi thrive in moist areas, and you could easily contract athlete’s foot, an irritating fungal infection which usually starts between the toes and causes symptoms like itching, burning, peeling, and cracking of the skin. What’s worse, you could be exposing yourself to any number of bacteria that could potentially be on the floors, including MRSA which can lead to painful abscesses. When you think Birkenstock, you probably think cork and leather, which are two of the last materials you want to wear near water. But the newest line of products from the brand gives you the possibility to wear some of the most comfortable sandals ever made at the pool, at the locker room, and even at the beach. Featuring the same anatomically correct footbed and roomy fit as the original version, the Arizona EVA is an amazing choice for anyone who’s looking for something superior to wear while getting wet. 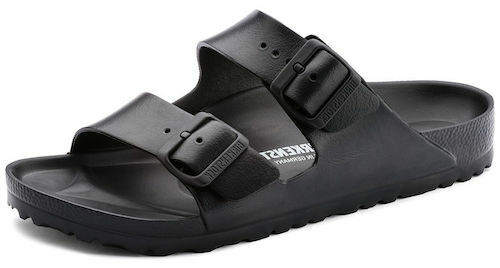 This sandal by Birkenstock features an anatomically correct footbed that has plenty of arch support to ensure proper posture. Even more, the toe grips allow for an easier walking experience, while the deep heel cup prevents overpronation and heel pain which often happen to those with low arches or flat feet. The Arizona EVA is available in a regular and narrow width and is supposed to give your feet a roomy fit that won’t constrict or rub. The upper is made with two buckles that allow you to adjust the slipper both over the metatarsal area, as well as in the instep. Crocs shoes are crazy comfy, which explains the fact that large numbers of people choose to wear them in public, despite their clunky looks. But when it comes to wearing in the shower, no other Croc is going to serve you as well as the Modi - a flip-flop style sandal that was developed with athletes and water wear in mind. Available in some colors, it’s a sturdy option you’re going to love wearing whenever you get the chance. All Crocs shoes are made with their famous Croslite foam that is both comfortable, slip resistant and buoyant. The Modi features a softer, more cushioning material in the footbed to give you a comfy experience, and a more dense outsole that ensures durability, abrasion resistance, and better protection. As most other Crocs shoes, the Modi features a massaging footbed that soothes your foot while supporting it in all the right places. Additionally, it’s made with a roomy fit so as not to pinch or rub in any place, which is perfect if you find that your feet tend to swell after a day full of activity. For those who prefer to forego rubber and are looking for something soft and comfy over the top of their feet, the Teva Mush II is the perfect choice. This thong sandal is great both for the beach and the dorm, seeing that it’s a stylish flip flop made by a company that focuses on effortless outdoor style and cushioning footbeds that conform to the shape of the foot. To top it all off, the come at a great price too! The straps on the Mush II are made out of a nylon weave that was made to be water ready. These straps won’t rub the foot, preventing blisters and hot spots that you may be experiencing with other flip-flops, and they will easily shed water and dry quickly so that they’re always ready to go. The dual density footbed of the Mush II is made with a cushioning effect that perfectly molds to your foot, giving you soft support under the arch, around the toes, and underneath the heel. It’s a lightweight slipper that’s easy to walk in; an even has the advantage of a grippy outsole. If you want to ensure the best protection from the grimy shower floor, then you’re going to love the chunky outsole of the Vertico Sport which both gives plenty of room between you and all that filth, and features a deep tread that can stand up to even the slipperiest of floors. This pair of sandals was made with gym and shower use in mind, and you’re going to love the fact that they fit perfectly into each other, making it easier to pack them into an overstuffed suitcase or gym bag. With an upper that’s made with plenty of openings, the Vertico Sport is a great choice for use in the shower. Not only will it allow you to easily soap up your feet, but it will also allow water to run over them, then quickly drain so that you’re not left sloshing around in soggy footwear. For those who like to go swimming at the pool as their preferred form of exercise, the Vertico Sport is a great choice. It features a rubber outsole with a deep tread that won’t let you slip and fall, even on completely wet tile. Kaiback Outfitters is a leading manufacturer of outdoor apparel including poolside and water-related footwear. You won't need to worry about slipping in these grippy sandals that boast an impressive tread for top-grade traction on any surface. These are a well-made water-ready pair of sandals that are perfect for all your summertime fun in the sun and are versatile enough to hop right into the shower with at the end of the day. The Kaiback Simple Slide features an incredibly grippy tread that has enough traction to keep you steady on your feet no matter how slippery the terrain. They're made for quick-drying wear and naturally prevent mildew from forming which also stops odors before they even start. 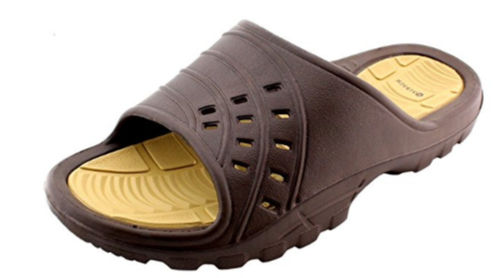 Made entirely of rubber the Simple Slide is a casual slip-on sandal that has a uniform design and built-in upper ventilation holes for extra airflow. The Slide boasts an impressive outsole tread and a two-colored structure for a stylish outdoors vibe. The Adidas Adissage SC is an excellent choice for any athlete out there, thanks to the carefully chosen materials used in its construction. It’s made with a PU coated synthetic for a waterproof and moisture-wicking effect, while the footbed and outsole both feature injected EVA that both cushions, supports and comforts the foot during after a hard practice. Even if you’re not looking for locker room slides, you’ll love wearing the Adissage SC thanks to its high levels of comfort. The Adissage features an extra-soft Supercloud EVA footbed that's water-resistant and quick-drying, along with built-in odor control technologies. Its synthetic lining makes for comfortable wear while a hook-and-loop closure strap allows you to customize its fit. The slip-on shower shoes are super easy to put on and take off, while an adjustable hook-and-loop strap allows for a perfect fit every time. These have plenty of wiggle room for water-appropriate pair footwear that is comfortable and stylish. The Under Armour Locker 3 is a one-piece slip-on style sandal that’s great for the locker room or even for poolside wear. They have a ton of great features and are an ideal pair of shoes for the shower. They offer a protective design that’s comfortable and versatile enough to wear inside and out. These slides also have the advantage of being easy to put on and off, which makes them suitable for use that does not include water. The Locker 3 is a quick-drying sandal and has a performance molded EVA footbed. With moisture wicking materials used in its construction, the Locker 3 will pull swear and water away from the foot, preventing any bacterial or fungal overgrowth that may occur in such conditions. These one-piece slip-on sandals are made stylish and are versatile enough to wear poolside or while you’re showering after gym class. You’ll look stylish either way thanks to the trendy and modernized look that the Locker 3 brings to the plate. The Quicksilver Molokai is available in eight colors and is a stylish yet simple pair of water-ready thongs. They're flexible and have an anti-slip sole which makes them an ideal choice for showering or poolside activities, while the fact that they’re a flip-flop means that they won’t look like your regular, out of fashion slides. They’re the perfect choice if you’re looking for a pair of shoes to wear while camping, as they can even be worn during everyday activities without having to change footwear. These thong sandals offer a slip-resistant outsole that prevents accidental slips or falls and are made from lightweight synthetic materials. The textured footbed gives a more comfortable foot feel, and they boast a Quicksilver contrast logo for a stylish and modern look. These shower-appropriate sandals are a casually designed thong that makes for super easy on and off wearability. They're manmade and offer a flexible and finely molded design for ultimate comfort. These slide sandals from Adidas, the Adilette Cloudfoam+, are great shower shoes because of their plastic and synthetic construction, making them easy to dry and clean. The bridge of the slides feature the classic three white stripes that define the Adidas brand. Lightweight and durable, you can’t make a false step with the Adilette. An EVA outsole adds comfort and grip, offering a fun, squishy feeling when you move around in them. Shock is absorbed by the sandal and the muscles are protected from undue pressure. The Cloudfoam Plus footbed feels like a soft, plush pillow for your feet. A great choice for inside or outside the shower, the Adilette offers athletic style with comfortable bliss. Grab a pair today, or if you intend to wear them inside and outside the home, maybe grab two pairs. For the cost of them, you really can’t go wrong with the Adilette Cloudfoam+. The Havaiana Top Logo are the classic flip-flops from Brazil. Lightweight, durable and simple in their design, they’re perfect for the shower and the beach. The original since 1984, feel like you are at the beaches in Rio, even though you’re just in your shower in New York. A special rice pattern sole is a feature on all Havaiana flip-flops. Preventing slips and falls, especially around water, is what Havaiana does best. Guaranteed to not lose their shape and made with a sandal thong that doesn’t irritate your skin, it’s great for even the most sensitive feet. With so many colors and prints available, Havaiana has been one of the top manufacturers of flip-flops for decades. You won’t be able to help yourself to just one pair because each one looks even cooler than the last. You may think that you’re safe to shower in a public used facility without being at risk for infection, but you’re not. Anytime you’re walking barefoot in an area with heavy foot traffic; you’re significantly increasing the risk of contracting certain fungal or bacterial infections. Fungi and bacteria thrive in environments that are moist, and the shower floor is the perfect spot for them to flourish. Many people are actively carrying fungi or bacteria, and they don’t even know it because they aren’t yet experiencing any symptoms, or because the person may dismiss the symptoms which they do have. These microorganisms are responsible for things like athlete’s foot, or a whole slew of other contagions that can be contracted just by touching a surface that the infected person has come in contact with without a protective barrier. So how exactly do shower shoes protect you? There are many other types of bacteria and viruses that you could make contact with while showering barefoot but the ones listed above are some of the most common. It may seem silly for you to think about the possibility of being injured while you’re in the shower, but realistically speaking no matter how young or old you are, public baths are a potentially dangerous place to be. Showers are slippery plain and simple, they’re wet and soapy which is the perfect recipe for disaster to strike. Shower shoes provide an anti-slip sole which is specially designed to provide better grip while you’re walking on slippery surfaces and can prevent slips or falls altogether. When you’re barefoot in the shower you have no additional grip and can actually hurt your toes and feet trying to grip the floor. In order for a shower shoe to properly protect you from the potential risks of walking barefoot while in a public shower, it will need to have solid construction and an outsole that will adequately work as a barrier between your skin and the floor. The shoes on this list have been carefully researched and selected in part, because of the level of protection that its outsole offers. Another protective element is the straps or closures that will ensure your shoe does not slip off potentially exposing the sole of your foot to a contaminated surface even if only momentarily. The style and materials of a shower shoe or slipper are critical aspects which are responsible for various aspects of the overall performance including safety, comfort, and protection. Rubber is an ideal material for the construction of a water shoe due to its superior waterproofing and anti-slip properties. Slip-on styles of footwear are ideal for use in the shower because they’re easy to take on and off and still allow for water to flow freely over the foot, but can have too much material at the heel which can be uncomfortable. Whereas a water shoe is a more enclosed option which limits the level of water flow and means having to fully remove the shoe while in the shower, limiting its ability to provide protection. Flip-flops or thong styles are very similar to one another except for the difference with the closures. Sandals have a solid piece or strap which acts as a closure securing the foot to the footbed, whereas a thong style will have two thin straps that meet and form one thin piece that sits between the big and second toes. The most comfortable style of footwear for the shower is open concept flip-flops or thongs. Any kind of slip-on shoe, in general, will be best for this type of wear because they are easy to slip in and out of, they also allow for adequate water to flow over the foot. Closures are a critical aspect relating to comfort which is especially true of a water shoe. An inappropriate closure can rub against wet skin causing discomfort and blisters which can further your risk of an infection if your bare feet connect with the floor. The ideal closure consists of a comfortably thin strap that does not press or rub too much, a hook-and-loop strap is a solid choice because you can adjust how tight it fits your foot. Buckles are best avoided because they can easily press or rub on the wet skin causing repeated friction and could even scratch or cut your foot. The material of your shower slipper needs to be water-resistant and offer a strong grip on slippery surfaces. Rubber is consistently appropriate for wearing in the water because of waterproof and grips well on slippery surfaces. Wet shoes and feet are the perfect combinations for manifesting odors. Shoes can become moldy and once mold sets in they will start to stink very quickly. Not to mention sweaty feet which are a huge contributing factor to unpleasant odors. Consider choosing a shoe that has built-in odor neutralizing properties and if possible, are made from a material that wicks moisture away from the foot. Again, rubber is a good choice of material for these purposes, though there are many kinds of shoes with these added benefits. Shower shoes aren't just to help you stay upright in the shower, and if you find the right pair, you can get a textured footbed that will allow for a great foot massage when you walk! Shower shoes can help protect you from bacteria and fungus that can cause athlete's foot and other foot health conditions. However, should you find you have itching, burning, yellow toenails or flaky, patchy skin, it could be signs of an infection. Seek out the advice of your doctor before starting any treatments! Wearing a pair of shoes while you shower will protect you from these harmful infections by shielding your feet and preventing direct contact with potentially contaminated surfaces. There are tons of cheap shoes and slippers for the shower that not only act as a barrier between your feet and the floor but are also designed to prevent slips or falls and could keep you from accidentally hurting yourself while soaping up in the shower. We have carefully researched the best showers shoes and slippers available to present you with a clear starting point that can assist you in your search for a quality pair of shower shoes that aren’t going to break your bank. q: Is it okay to wear the same shoes poolside and then while I shower? Absolutely. Your shower shoes are going to be getting wet whether it’s poolside or while you’re in the shower so why not make multiple uses out of your slip-on shoes. Just be sure that you’re not dragging any mud into the hallways from outside while you’re on your way to the shower. You can always hose off your shoes outside first to ensure there’s no dirt on them before going inside. q: Can I wear a leather shoe in the shower? Leather is not an ideal material for the water because it has a tendency to crack and become brittle after time once it’s been wet. Materials that are better suited for the shower are rubber, PVC, plastic, and TPU. These materials are water-repellent and quick-drying while also being resilient and will not sustain any damages from repeated exposure to moisture. q: Can I wear my shoes outside before I shower in them? Yes, depending on where you are planning to shower off. If you’re going to be wearing a pair outside then they’re going to get muddy and you don’t want to be tracing mud through your dorm halls, but if you are wearing them outside and planning to rinse off in an outdoor shower then go ahead and get those shoes good and dirty first because they can easily just be rinsed off while you wash yourself. q: Where can I buy shower Shoes? There are many brick and mortar stores which sell shoes that are appropriate for showering but online retailers are a better option because there are usually better savings to be found. Online merchants save on the costs associated with running a physical location and therefore are able to charge less for merchandise. q: How do I clean my shower shoes? The great thing about these styles of shoes is that you can simply step into the shower and rinse your shoes off, or you can step onto your patio and hose them off. There’s no need to take any special measures while cleaning them, but you may choose to wash them down with a cloth and some soapy water from time-to-time for antibacterial cleaning. q: Who makes the best footwear for the shower? There is no one company that makes the best shoes for showering, but there are several who stand out from the rest including Crocs, New Balance, and Adidas. We have included options from the leading manufacturers of water-appropriate footwear who continually use high-quality materials and craftsmanship in the making of their items. A quality pair of shower shoes will last for a long time because you won’t be wearing them for much outdoor activity. Ideally, you should only be wearing your sandals in the shower or for other poolside activities as to prevent yourself from tracking dirt into the shower room area and potentially increasing the risk of other people coming into contact with bacteria.